Michael Franz, co-author of The Persuasive Power of Campaign Advertising, explains why he and Travis Ridout study those dreaded political advertisements, and why they are both important and effective in our polarized political environment. Everyone says they hate political advertising. When I tell people I study the effects of political advertising on television, the usual reaction is something like, “Oh, I always tune that stuff out.” The problem with believing that such sentiments are widespread, however, is that candidates, parties, and interest groups clearly believe that their ads work, since they spend so much money on them. In the 2010 midterm elections, between January 1 and Election Day, over $1.4 billion was spent on broadcast television spots in House, Senate, and gubernatorial races, not counting local cable, radio, print, or the Internet. So who is right, the candidates who spend so much time raising money for ads, or the people who usually roll their eyes when I talk about my research? The existing scholarship in political science is pretty clear that ads do move voter perceptions, not in huge numbers, mind you, but in small doses and at the margins. The margins are where the action is in American politics, though, so ads are really important to winning close elections. But what kinds of ads matter? And which kinds of voters are most open to these messages? Moreover, are we more likely to witness advertising effects in particular races? 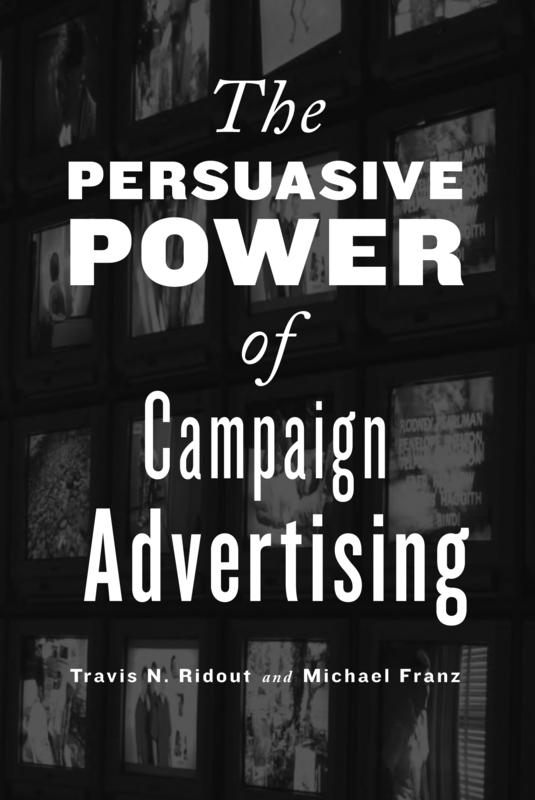 These were the questions that Travis Ridout and I address in our new book, The Persuasive Power of Campaign Advertising. We look at U.S. Senate and presidential elections between 2000 and 2008, and we make use of survey data and aggregate election results to estimate the influence of political ads. One of the most important findings in the book is that ads seem to affect political novices the most. Voters who know less about politics are the ones who get the most benefit from seeing ads on television, while those who are knowledgeable about politics more easily turn them out. This finding might concern us if ads were driving these voters away from their pre-dispositions, but they are not–Democratic voters still by and large prefer Democrats and Republican voters still prefer Republicans. Seeing a bunch of ads from one side, however, can move you towards higher levels of support and approval for that candidate. It might not change your vote, but it makes the decision in the ballot box a bit more uncertain. That, after all, is what elections are about, and the balance of our results suggests ads are not falling on deaf ears. More so, we address an important question about the future of political advertising, the increasing presence of online political ads and videos. Are these messages persuasive? Who is seeing them? The data are hard to come by, but one of the things we uncover is that visits to Obama’s and McCain’s websites in 2008 are, as you might expect, largely dependent on where you live, either in a blue or red state. Blue state people tended to visit Obama’s site, where he posted his ads and videos, in disproportionate numbers than people in red states. Vice versa for McCain. This potentially indicates that online persuasive appeals are more likely speaking to core supporters, not fence sitters. One of our core claims is that while so many people assert a hatred for the political ad, we live in a polarized political environment. The ads you see on television between sports and weather during your local news, however, might be the only times you see a message from a candidate you don’t know anything about or don’t like. It might be the one opportunity you get in an election to hear messages that compel you to reconsider your vote. In that sense, political ads are one of the only means left in contemporary American politics that help bridge the polarization. And for that reason alone, I’m a fan.